Marianne Bluger (1945-2005) was born in Ottawa and graduated from McGill. She raised two children as a single parent. For twenty-five years she was administrator of the Canadian Writers’ Foundation. She also co-founded the Tabitha Foundation (to support the people of Cambodia) and Christians Against Apartheid. She published 11 books of poetry. 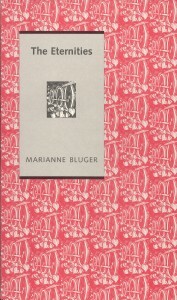 Marianne posthumously contributed to Poetry as Liturgy (2007). “It is difficult to single out any weakness in The Eternities” (Jesse Ferguson, Bywords). “this collection of poems speaks to the power of love, remembrance, and hope’s regenerative power in the face of the remembered horror of the Holocaust . . . Bluger’s poetry brilliantly evokes the power that resides in a daughter’s enduring love for her father” (Kim Fahner, CBRA).